Big fallers on the FTSE included Thomas Cook, down 4.7%, and the new BA/Iberia airline group IAG, which fell 2.6%. The Foreign Office has advised “against all but essential travel to Cairo, Alexandria, Luxor and Suez”. It comes as the US and other countries launch operations to airlift their citizens from Egypt. Thomson holidays owner TUI Travel, which saw its shares drop 2.7%, has cancelled flights to the Egyptian city of Luxor. Many tourists in Red Sea resorts have been unaffected by the upheaval, but that has not prevented the fall in the travel-related shares on Monday morning. Another big loser was Intercontinental Hotels, down 2% in trade in London. Police have been ordered back on to the streets of Cairo, as tens of thousands of people gather in central Cairo for a seventh day of protest. Protesters want President Hosni Mubarak to step down after 30 years in power. The president has ordered his new Prime Minister Ahmed Shafiq to push through political reforms. 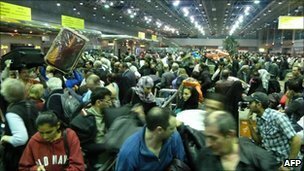 On Monday, New Zealand joined a growing list of countries warning their nationals not to travel to Egypt if they can avoid it, and the US, India, Japan and China are among states preparing to evacuate their citizens from the country. Tourism is a vital sector in the Egyptian economy, accounting for about 5-6% of GDP.